Jennifer Weiss-Wolf is a leading advocate and writer on the issue of menstrual health, fairness and equity. She partners with policymakers to pioneer viable solutions; entrepreneurs who create markets for innovative, sustainable products; and activists who spearhead social media campaigns and donation projects. Through her work, Jennifer is helping to coalesce and advance this growing global movement. She is a lawyer and currently serves as a vice president of the Brennan Center for Justice at NYU School of Law. Visit her web site to learn more: www.jenniferweisswolf.com. 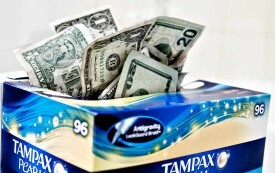 Why Are We Paying Sales Tax on Tampons? States exempt food and other necessities, but not menstrual products, from sales tax. How is that fair?